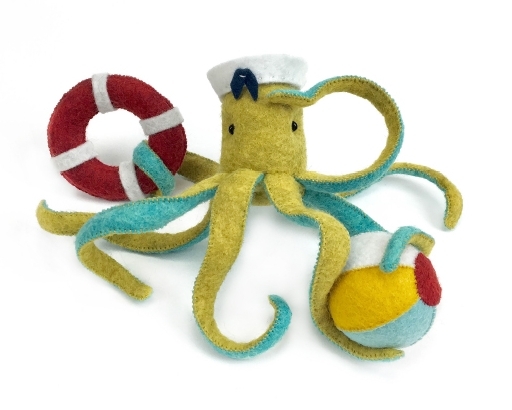 Well, folks, it is finally happening… I will soon be launching the long-awaited Octopus kit! You may already know that Crate & Barrel has been producing my Octopus ornament (with red hat, mittens, and snowballs) for several years and I am happy to say that it is available once again this season. For all of you not yet sewing, the C&B ornaments are a ready-made, super fun addition to winter holiday decorating! For my dedicated sewing enthusiasts, threadfollowers and makers, the Ellie Octopus kit and PDF download pattern will be completed soon! In the new kit/pattern, Ellie Octopus has changed colors to a glorious gold and aqua with dreams of water and waves and fun in the sun. The skills needed to make Ellie are quite basic, but with eight legs and accessories, the patience of my level three kits is required. That said, Ellie would be a fantastic kit to collaborate on with a young stitcher if you have someone special in your life!